With games falling all around us following the recent snowfall, United’s SKYex pitch looked like a bowling green thanks to the hard work of General Manager Derrick Matthews and volunteer Kevin Taylor and Paul Hughes’ side extended their lead at the top with a comprehensive drubbing of visitors Hertford Town. Even outscoring the Blues once down to 10 men, following the dismissal of skipper Scott Donnelly on 67 minutes. 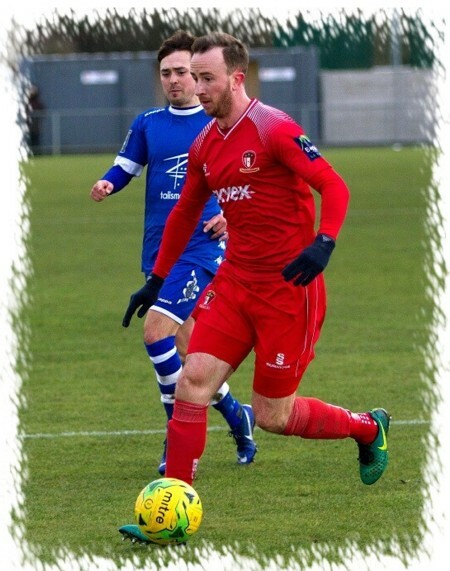 The gaffer retained the same starting XI that had won comfortably at Chalfont St Peter in the snow on Tuesday evening while both Duncan Culley and George Spiers both returned to the United bench. United again started at great pace, creating the first opening within just 45 seconds. Nick Elliott and Scott Bridges combined well in midfield with the latter picking out the forward run of Lee Barney who saw his shot deflected wide for a corner. The corner was partially cleared by Mulik Rickman but only as far as Liam McDevitt who saw his volley blocked wide, the corner this time being well held by Hertford ‘keeper Charlie Mann. On 8 minutes United required a change when Roddy Collins went down injured and could not continue, his replacement being George Spiers. Elliott, making his first appearance at the SKYex, was the instigator of another forward surge in the ninth minute, having won possession in midfield he fed Toby Little on the left side, he outpaced Joe Clemo down the flank and crossed deep to Josh Chamberlain who got a firm header in that was well saved by Mann. The breakthrough for United came in the fifteenth minute when Ed Asafu-Adjaye lofted a perfect ball over the visitors defence to Bridges who was tripped from behind by Rickman having controlled the ball giving referee Oxenham the easy task of pointing to the spot. Scott Donnelly stepped up and sent Mann the wrong way for his 17th strike of the campaign. Two minutes later United were again flying down the left after Little sent Chamberlain on his way, his low centre aimed for the on-coming Barney being grabbed just in time by the sliding Mann as United’s top scorer closed in. A second enforced substitution following an injury to Elliott saw Duncan Culley join the forward line on 21 minutes with Chamberlain dropping back into midfield. It was almost 20 minutes before another opening as Little’s cross whizzed across the six yard box without a touch although the visitors may have “got away with one” earlier as having cleared a scramble in their own box, Jay Lovell appeared to tread on Little’s ankle while he was grounded but with the referee’s, and most of the United players following the ball up the field, nothing came of the incident and Little limped on. It was fully 38 minutes before Charlie Burns in the United goal was troubled, the stopper doing well to push wide a Ruben Soares-Junior header after he had connected with a McCauley Joynes free-kick in front of goal. Two minutes from the break United started the floodgates opening by doubling their lead. 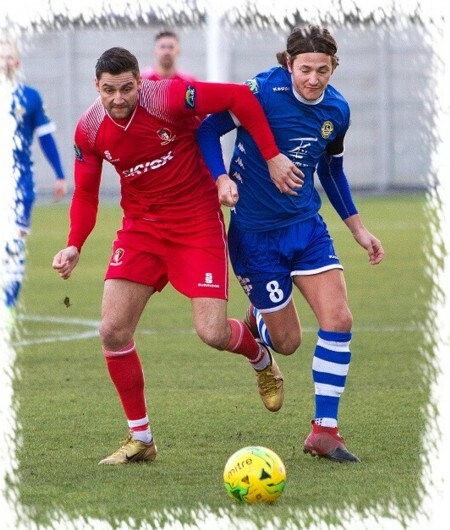 Bridges nudged a quick free-kick to Donnelly, the skipper fed the advancing Asafu-Adjaye who clipped a beautiful centre over the centre of the Blues defence to Barney who headed powerfully into the top corner of the net giving Mann no chance. Two minutes later United had a third. The ball was played out from the United defence to the left side, Joe Clemo slipped which allowed Little to power away from the full-back, his pull-back picked out Bridges who saw his shot well saved by Mann but as the ball ricocheted into the air, Chamberlain rose highest to head home with the referee’s assistant ruling the ball had crossed the line before both a clearance attempt by Lovell and Bridges smashing the loose ball home. United made their final change at the break with the defence re-shaping as Rylan Myers was replaced by midfielder Callum McAllister. The visitors were first out of the blocks this time, just four minutes had been played after the re-start when the ball was played into the United box from the left, Soares-Junior saw his shot blocked by McDevitt, the follow up by Brett O’Connor was also blocked out by the United defence with attempt number 3 coming from Rickman who blazed over from the edge of the box. Three minutes later United had number 4. Louis Bowen slipped when trying to kick clear from ear his own corner flag, Spiers and Bridges exchanged passes before feeding Donnelly, his centre was headed out by Lovell but only as far as Little who was lurking in the “D”, a chest down and a volley into the top corner followed as the United wing-back netted, unbelievably, his 19th of the season. Just before the hour mark United went close once more, Culley ran at the Hertford box before laying the ball left to Barney who saw his low drive from a tight angle deflected wide by Bowen. Minutes later United netted again when Mann’s poor pass to Joynes left his defender struggling to clear under challenge from Barney, Donnelly intercepted and played the ball first time to Culley who turned in the box and fired through Mann into the far corner. Four minutes later United were reduced to ten men when Donnelly’s challenge in the middle of the park was adjudged to be reckless by referee Oxenham who pulled out a red card. Ten minutes later and without being troubled at the other end, the ten men scored a sixth. 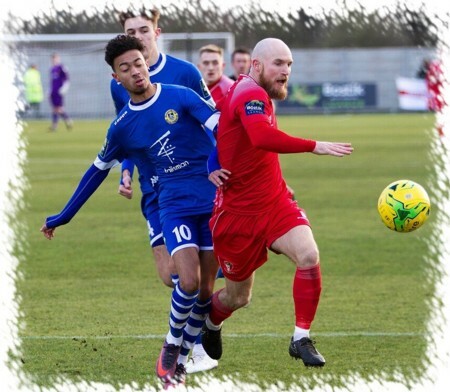 A loose pass in midfield was missed by Blues substitute Ahmed Mohammed, Culley collected the loose ball and set off towards goal with Mohammed giving chase, as Culley rounded Mann the 'keeper collided with his own defender as Culley rolled home his second of the game. 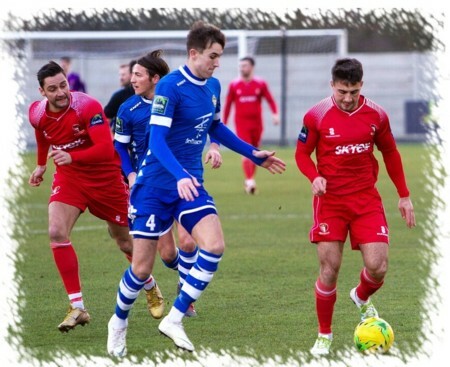 With ten minutes left to play the visitors finally got on the scoresheet as the ball was played from midfield out to an unmarked Charlie Edwards, the Blues skipper racing at the United box before curling a perfectly executed shot around Burns’ dive and into the United net. 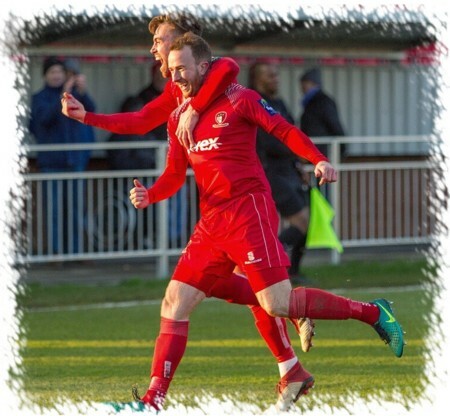 Despite being a man light, United were far from finished and number 7 came on 84 minutes, Barney collected the ball on the left side in his own half, ran through the Hertford defence and skipped around Mann before rolling the ball into the empty net for his 29th strike of the season. Number 8 came three minutes later, Bridges shot from just outside the box was blocked back to the same player, he fed Asafu-Adjaye on the right side and his perfect cross to the far post was headed home by Culley thus completing another United hat-trick for the striker with his fifteenth goal of the campaign. With this result, United advanced their league goals tally to 95 (add in 35 cup goals) still with fifteen league and at least two cup games to play, any bets on an end of season total?